Cosmetic lip tattoo is a great way to reshape/define and enhance lips. Pigment can be restored for those who have lost pigment through sun damage, injury or medical problems. Lips can be reshaped for uneven shaped or thin lips. Colour can be returned to pale lips. 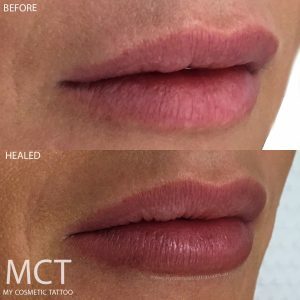 There are a few different techniques of Cosmetic lip enhancing tattoos. For more information on Lip Tattoo Procedures visit our FAQs section. Lips can be tattooed in many ways. Some prefer just a lip line to define the lips and add volume. This is done by lining the lip just like a lip liner pencil. Others opt for a Lip blend tattoo, this is when we create a lip line and blend it into the lip creating an ombre finish, this usually results in a very natural finish. 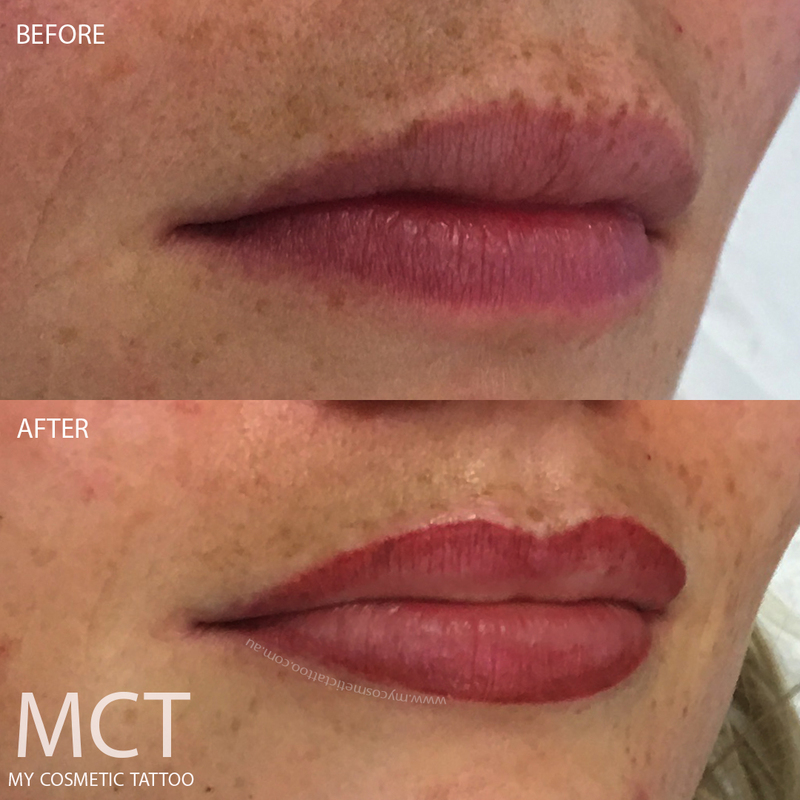 We can also tattoo the full lips to add colour and stain to the lip, this is great for those who have pale lips, or those who love colour on their lips. Lip tattoos can last anywhere from 18 months to 18 years! Most clients opt for a touch up refresher within 24-36 months. Longevity is dependent on life style, skin type and daily skin routine. Before and healed lip blend tattoo.